This pattern is currently experimental because more research is needed to validate it. 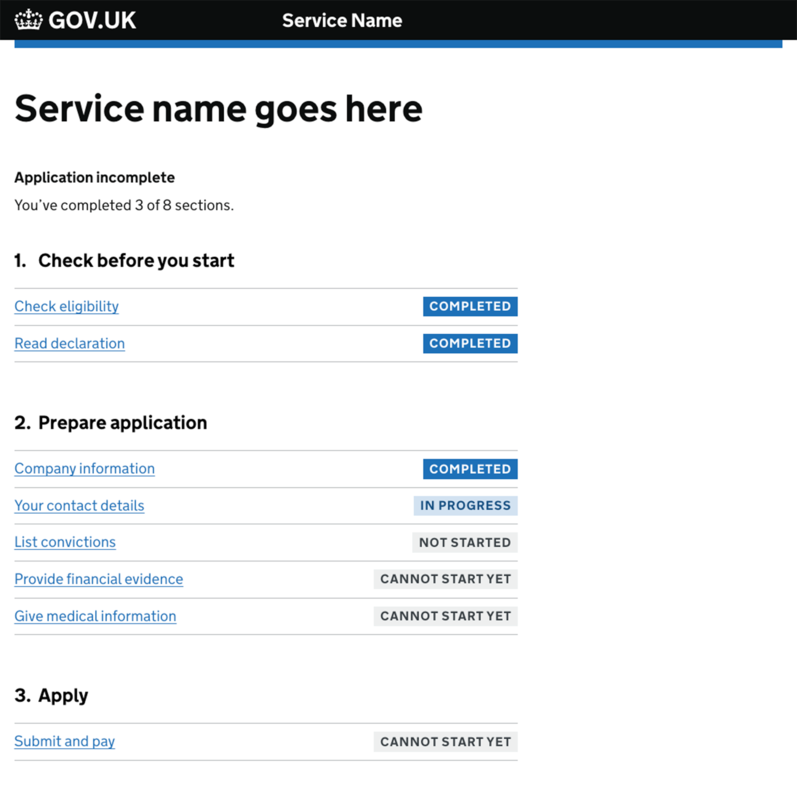 There is a coded example of a task list page in the GOV.UK Prototype Kit. Only use a task list page for longer transactions involving multiple tasks that users may need to complete over a number of sessions. Try to simplify the transaction before you use a task list page. If you’re able to reduce the number of tasks or steps involved, you may not need one. If there are lots of tasks to complete, you might also need to group them into sub-sections. Whenever you show a task list page, make it clear to users which tasks they’ve completed by labelling them ‘Completed’. Group related activities and questions into tasks, for example, ‘Provide financial evidence’ and ‘Give medical information’. This will help users understand and plan what they need to do. If your transaction involves lots of tasks, make it manageable by splitting it up into sections that represent stages in the process. For example, you could group all tasks which help users find out if your service is right for them in a section called ‘Check before you start’. Where possible, allow users to complete tasks in any order. This will help them plan their time and complete sections as and when they can. This pattern was originally developed and tested by a team at the Government Digital Service (GDS). The team built prototypes of task lists for 3 services, Register as a childminder, Learn to drive and Transport goods and tested them with 34 users over 5 rounds of research. The pattern was iterated after each round of testing. You can read more about testing and iterating the task list page pattern. There is evidence that the completed tag might be misleading to some users. In one instance, a user saw a task marked ‘completed’ and thought this meant they had submitted their response. As a result, they did not continue to the ‘Check and submit your response’ task, and were later issued with a court order for not responding. This pattern has been used in a number of services, including the following. Work is needed to ensure that users can understand the difference between completing a task and completing the whole service.